Those of you who have been to Greece may know that it is against the law to remove anything at all from the ancient sites there or take any relics out of the country. Also included in that prohibition: skulls. Two U.S. tourists have been charged with "desecrating the dead" after security officials at the Athens airport found six human skulls in their carry-on bags. The tourists said they bought the skulls in a shop on Mykonos and assumed they were fake. "Hey, we got you something while we were in Greece," they apparently planned to say to up to six friends and/or family members upon their return. "It's an actual fake Greek human skull that we got on Mykonos!" Thanks so much. Is Mykonos famous for its skulls or something? 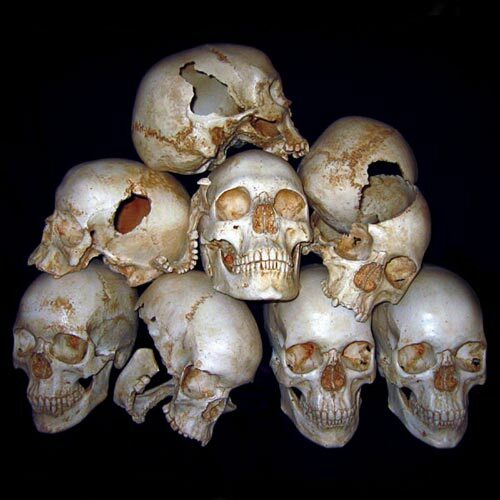 Police said a coroner had confirmed that the skulls were actual real human skulls. The alleged skull-smugglers have been released pending trial. I guess I should also mention again that it is illegal to bring human heads into the U.S., at least if you fail to declare them.